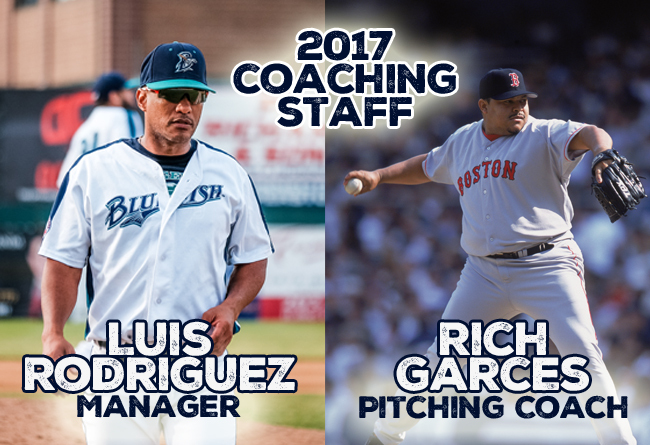 (Bridgeport, Conn., Dec. 14, 2016) – The Bridgeport Bluefish today announced that Luis Rodriguez will return as Manager in 2017. The team has also appointed Rich Garces as Pitching Coach. The 45-year-old began his playing career in 1988 after being signed by the Minnesota Twins as an undrafted free agent. He spent his first seven seasons with the Twins organization, making his Major League debut in 1990. He has also appeared with the Chicago Cubs, Florida Marlins, and Boston Red Sox, which he called home for seven consecutive seasons from 1996 to 2002. Rich, commonly referred to as "El Guapo," made 287 big league appearances. He owns a 23-10 record with a 3.74 ERA and 296 strikeouts in 341.1 innings pitched.